Jim was on time, very professional, showed me how to use the new deadbolt (that he did not install). He made it so it was convenient to use all the locks easily. And he spent time to explain to me the benefits and alternatives of several different ways ways he could do what I needed. He was great! Rekeyed the cluster mailbox, put a new handle and lock set on outside storage closet, refit the deadbolt on front door so the bolt would fit in the door jam hole. >Jim was on time, very professional, showed me how to use the new deadbolt (that he did not install). He made it so it was convenient to use all the locks easily. And he spent time to explain to me the benefits and alternatives of several different ways ways he could do what I needed. He was great! Rekeyed all exterior locks (5) and cut 7 keys. Lost my house key about a week ago. After looking everywhere decided to have the locks changed. 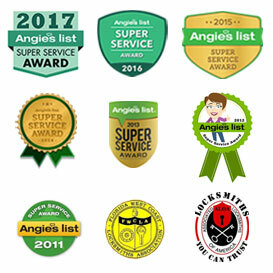 Consulted Angie’s list and chose Florida Keys Locksmith, an A-rated locksmith, and called to arrange the service call. Jim was out later that day and rekeyed the exterior door locks. I found the price to be reasonable with 7 keys provided. I will certainly use this company again.